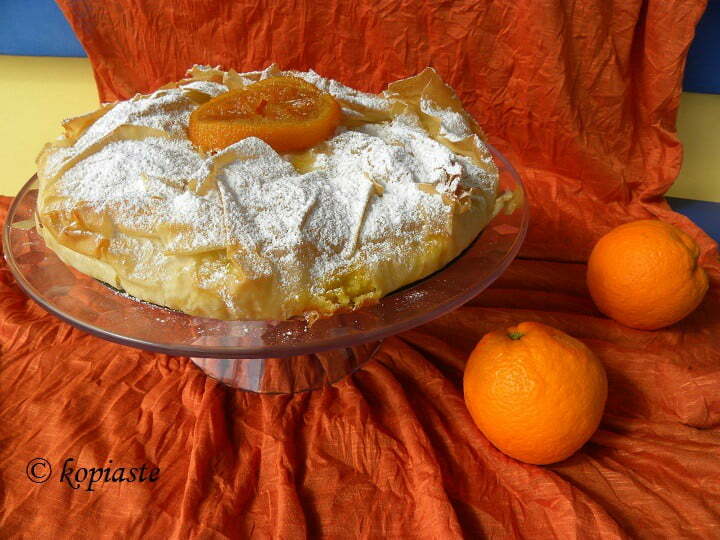 Portokalópita (from portokali = orange and pita = pie) is a traditional Greek sweet pie made with phyllo which encloses an orange pudding. Although I had heard of this dessert many years ago, I never made it until today. Since my last post, I’ve already made a second batch of Orange Preserve in slices, as well as Orange Marmalade. Since there were still a lot of oranges left, I decided to give this dessert a try. There are many different approaches to the recipe. Some are made without phyllo and some use shredded phyllo in the batter (see my second recipe for Tyropita) and some make it into a cake, with yoghurt and then it is drenched in syrup. I am sure that in the future I will try making some of the other variations. I decided to make the recipe of our Greek Pastry Chef, Stelios Parliaros, with a few changes of my own. Instead of making it open faced, mine was covered with phyllo. Instead of using the huge amount of butter mentioned in the recipe, I substituted part of the butter with margarine, as I did not have any butter at home, and some of the butter with olive oil. I added less icing sugar and added a few drops of citrus essence in the batter. Boil the orange, for about 45 minutes or until soft. Melt the butter in a small pot or in the microwave for a couple of minutes. In the meantime blanch the almonds and dry them on kitchen paper. Put them in a food processor with half of the icing sugar and powder them. Remove to a bowl. When the orange cools, remove seeds, if any and purée it in the same food processor. Whisk the eggs with the remaining icing sugar, using a hand mixer. Add the pulp and gradually incorporate 2/3 of the butter. Finally add the almonds and mix with a spatula. Brush a 28 cm tart pan with remaining butter and add a greased sheet of phyllo. Continue with three more, brushing them each time with butter. Add the orange batter on top. Put the leftover pieces on top of the batter and then bring some of the phyllo hanging outside on the batter, leaving a last layer. Finish with the two remaining sheets. Tuck them well using your brush and add the last layer of phyllo which was hanging outside the pan. Bake in a preheated oven to 180oC/ 350oF (160oC if a convection oven), for about 30 - 40 minutes or until golden on top. Set aside to cool and sprinkle some icing sugar on top. I used a 28 cm tart pan, which I brushed with olive oil. I cut each phyllo 35 x 35 cm. The remaining bits and pieces were lightly oiled and added as another layer in the tart pan.